It’s been so dull and rainy lately that I crave color. Our colder than normal spring has keep the fields in a state of brownish black with a very light mottling of green as the corn tries to grow. This one is from September 29th 2012 near Delft, MN. Blue skies, golden fields and well known green of John Deere. 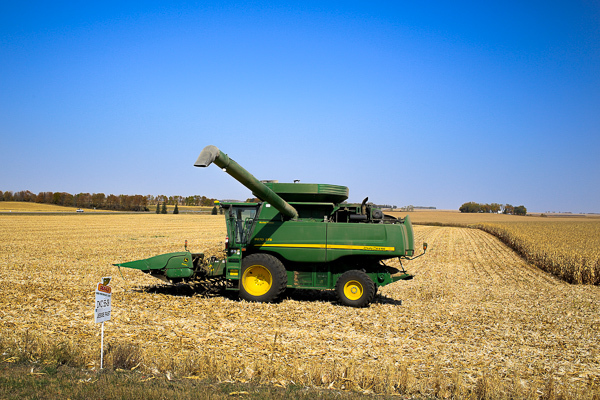 This entry was posted in Uncategorized and tagged 9670, agriculture, combine, copyright ryan ware, family farm, farm life, farming, field, john deere, john deere 9670. Bookmark the permalink. Colors are always so crisp and sharp in autumn, one the reasons I particularly love this season, although I’ll take some summer right now. Summer would be nice. But you are right. In the Autumn the humidity leaves and the air is just right for sharp photos.